pgModeler is an open source tool for modeling PostgreSQL databases which is very similar to MySQL Workbench. 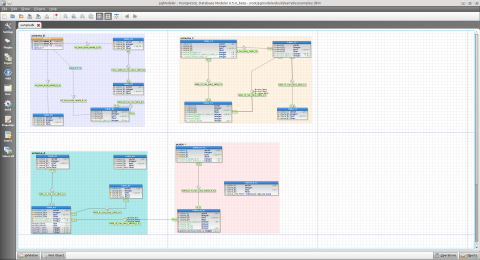 The models created by the user can be exported to SQL code and applied directly into database clusters (Version 9.x). As a Workbench user, it took me only couple of minutes to design my first PostgreSQL database model. Since the Oracle bought Sun (including MySQL), I wanted to improve my knowledge about other databases and to check the alternatives (in case “something” happens to MySQL). Luckily, MySQL is still here and it still works fine but in the last couple of months, I wanted to dig a little bit about PostgreSQL. I thought that it would be easy to find online tutorials about this topic but I noticed that online tutorials and forums about PostgreSQL are not so popular. Don’t get me wrong, there are several blogs which fits perfectly in my learning habits but spending so much time just to find the basic things is not what I wanted. Instant PostgreSQL Starter by Daniel K. Lyons was exactly what I was looking for. A small (48 pages) book was right away uploaded to my DropBox so I can have it where ever I go. The book covers everything you need to start with Postgresql. You will learn how to install Postgresql, how to connect and create your first database. The book also covers basic SQL queries for creating tables, CRUD (create, read, update and delete records), etc. The last part of the book contains some features you should also know (how to store passwords, working with XML, Full text search and basic options for improving speed and security). Couple advices about backups are also there. Using pgAdmin III as a GUI tool won’t be a problem because the book contains pgAdmin screenshots. Don’t get me wrong…. The book has only 48 pages and it can be compared with a cheat sheet but it is a very good portable book. Learning Postgresql can take only one afternoon and in less than a weekend you’ll became a “usable” DBA. After the Postgresql starter book, I switched to PostgreSQL Backup and Restore How-to. We usually like to say that backup doesn’t have the price and every DBA should know everything about creating and restoring backups. Just like the first book, this one is also uploaded to my DropBox. Having those books with you is a nice idea and I highly recommend them to all Postgresql beginners. You can buy them as an e-book and as a hard copy. the next step would be to create root user and to change postgres and root password. Now, the next step would be to allow remote connections. PostgreSQL, by default, refuses all connections it receives from any remote host. The remote hosts can be controled via pg_hba.conf file (located in the same dir like postgresql.conf). where 192.168.10.57 is the remote host IP address. Also, you can allow any host by replacing the 192.168.10.57/32 with 0.0.0.0/0. which is documented inside the pg_hba.conf. Save the file and restart the server. I prefer the pgAdmin III tool which can be used for remote management. Fire it up, select File, Add Server… Enter name, host, Username and password. Why PostgreSQL is not so popular? Good tutorials about PostgreSQL can be found but not so easy like for MySQL. 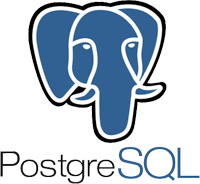 I decided to install PostgreSQL on my own server just to see what is the main benefit and how it can be used as a MySQL replacement. I’m using CentOS 6.x and I removed the default PostgreSQL installation with yum remove postgresql* so I can install the latest PostgreSQL (9.2.1). As I noticed on http://yum.postgresql.org/repopackages.php, there is a yum repo which has the latest rpms. If you want to do the same, chech your distro version and platform with uname -a. In my case it was CentOS 6.2 x86_64 which means I need to download http://yum.postgresql.org/9.2/redhat/rhel-6-x86_64/pgdg-centos92-9.2-6.noarch.rpm. inside [base] and [updates] sections. The added lines will help you to avoid the default PostgreSQL rpms which are usually very old. To skip this problem, rename the postgresql-9.2 to something similar like other PostgreSQL commands. For example psqld (similar like mysqld). ERROR:  syntax error at or near "quit"
ERROR:  syntax error at or near "exit"
ERROR:  syntax error at or near "close"
The first problem with PostgreSQL is the name… PostgreSQL is a to long name for normal usage. That’s why the service name can’t be postgresql-9.2.